The country is learning hard lessons about direct democracy from the Brexit process. Robert Hoskins argues that those lessons should fundamentally alter Scotland’s attitude to any proposed second independence referendum. The ferocious energy unleashed by Hurricane Brexit still dominates our political discourse two years on and shows no signs of blowing itself out. Its awesome destructiveness has trashed the UK body politic including the Conservative Party, and has left in its wake a country which both the CBI and TUC say is in a ”state of national emergency”. Leaving the EU without a deal is now an increasingly likely prospect. I have read so many different analyses which have attempted to explain how answering a simple constitutional question could cause so much collateral damage to our democratic system. The most popular of these narratives include: the discrepancy between the Leave result and the Remain majority in the House of Commons; the utter uselessness of the Prime Minister who did not have the requisite skill set to deliver it; and the PM pandering to the ideological extremism of the hard-line European Research Group. Although all these ideas have resonated with the public as plausible explanations to account for the current chaos, there has been little debate or critical analysis about the important part played by the terms of the referendum itself, which after all was the midwife which delivered this chaos in the first place. 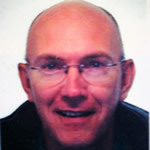 The closeness of the result and the subsequent clamour for a people’s vote begs the question as to how fit for purpose is a first past the post referendum, with no built in super majority threshold or confirmatory vote, to decide matters of such crucial importance as secession of the UK from the EU, or indeed secession of Scotland from the rest of the UK? I am not arguing that a referendum should never be used for constitutional change. Take Scottish independence for example. If we are saying that having a majority of SNP MPs at Westminster or a majority of SNP MSPs at Holyrood does not create a mandate for independence, what other legitimate means is there left for nationalists to campaign to secede from the UK other that by means of a referendum? What I am saying is that the method implemented in the last two referendums needs urgently reviewed. The Brexit fiasco has exposed major weaknesses in the referendum process in ways which the Scottish referendum didn’t do because we voted for the status quo – to remain part of the UK. There are in my view four major structural components of the referendum process that need to be re-examined and modified. 1. What percentage constitutes a winning vote in a secession referendum? Are we really saying a simple majority of 50%+1, as currently exists, reflects the settled will of the people and is enough to secure a permanent material change in constitutional circumstances such as Scotland leaving the UK or the UK leaving the EU? A first past the post referendum is no way to settle a crucially important constitutional issue such as secession. It is quite frankly a ridiculous notion which has been partly to blame for the aftermath of rancour, bitterness and division caused by the closeness of the result of the current EU referendum and the Scottish independence referendum (51.9% – 48.1% – 1,269,501 vote majority and 55.3% – 44.7% – 383,937 vote majority respectively). It is astonishing that the requirement of a supermajority was not factored into the process for both referendums. The most common type of supermajorities include three fifths (60%), two thirds (67%), and three quarters (75%). All are commonly used by institutions to change their rules of engagement. For example, UK law requires business mergers to gain the agreement of 75% of their shareholders before amalgamation can occur. The recent case at Muirfield, the men only golf club which balloted its members to see if they wished to accept female members, required a two-thirds majority of members to agree to the proposed change before it was accepted. Guidance for the conduct of the Scottish referendum was contained in the bilateral Edinburgh Agreement and was surprisingly vague with regards to what constituted a fair result. The Edinburgh Agreement promised that the referendum should deliver for the people ”a fair test and a decisive expression of the views of people in Scotland and a result which everyone will respect”. Fifty percent plus one does not by any stretch of the imagination represent ”a decisive expression of the views of the people”. As calls for a second referendum intensify, the Edinburgh Agreement has also quite clearly failed to deliver ”a result which everyone will respect”. So, where do we go from here? Nigel Smith, the former chair of the campaign that delivered the Scottish Parliament, has attempted to address this major flaw by arguing that in future Westminster should adopt a supermajority threshold of 55% for any successful Yes vote. The 55% threshold also has a political precedent as it was used in the 2006 Montenegrin independence referendum which was narrowly passed by 55.5% of votes cast. My own preference would be to plump for the supermajority threshold that the First Minister used to favour – that of at least 60% which she indicated would trigger a demand for a 2nd referendum. That figure, if achieved in a 2nd independence referendum, would be seen as a legitimate mandate which reflected the settled will of the Scottish people by both winners and more importantly losers too. 2. What should the turnout threshold be in a secession referendum? It is also a long-standing principle that a secession referendum requires to meet a stipulated turnout of well over 50% to be seen as a legitimate vote. This has not been an issue with the Scottish referendum which had a turnout of 85%, or the EU referendum (73%), but it could be a matter of concern for any future secession referendum. Those of us of a certain vintage will remember the 1979 Scottish devolution referendum which delivered a 51.6% Yes vote but which failed to meet the controversial Cunningham amendment which stated that the Yes vote had also to meet a critical threshold of 40% of the total electorate eligible to vote to be seen as legitimate. 3. Should there be a confirmatory referendum following an initial vote for secession? The whole Brexit journey has been a massive learning experience for the UK electorate because, unlike the Scottish referendum, Brexit will be the first referendum ever that has enabled us to compare what the winning side was offering on polling day with the final ‘deal’ that is being negotiated on our behalf. Ironically two years on we still don’t know what the deal is. But what we do already know for certain is that, no matter what the final exit deal is – staying in a customs union, creating a Norway plus or Canada plus settlement, or leaving on WTO rules – it was not specified before we voted. We also know that what was specified before we voted won;t be delivered; even Nigel Farage has stated that there won’t be an extra £350 million per week going into the NHS. Brexit has demonstrated, in ways which the Scottish referendum didn’t (because we voted to remain in the UK), that any future referendum on Scottish independence must now include a confirmatory referendum after the departure deal has been sealed. I would go further and say that one of the many unintended consequences of Hurricane Brexit is that it surely has blown the concept of a one-off referendum out of the water and rendered it obsolete. For those who are not convinced about the need for a confirmatory referendum let’s look at just one of the stark economic consequences of NOT having a confirmatory referendum had there been a majority for Yes in 2014. Let’s use the 18 month time line from the referendum vote itself to independence day March 24th 2016, which the Yes prospectus, ‘Scotland’s Future’, specified would be long enough to break up our 312 year old union. Let’s really stretch our imaginations and pretend that the final deal between Scotland and the rest of the UK actually had been negotiated and signed off on March 24th 2016. Let’s also make March 24th 2016 the day we had our confirmatory referendum vote, enabling us to compare what ‘Scotland’s Future’ promised to what was actually going to be delivered. Before September 18th 2014, the price of a barrel of Brent crude oil was around $100. The economics underpinning the Yes prospectus were predicated on a barrel of Brent crude being $113. By March 2016 the average price of a barrel of oil had dropped dramatically to $43, which would have left an independent Scottish economy in crisis and its people experiencing eye watering austerity for generations to come. Useful information to know in advance of a confirmatory vote, as would be the financial impact on taxes and welfare cuts resulting from the loss of the annual £12 billion fiscal transfer from Westminster. Surely the electorate would have been entitled to know in advance before they sealed the deal on independence which of their taxes would have to be increased and by how much and which of their welfare services would be slashed and to what extent to pay for the economic catastrophe that would have awaited the first day of an independent Scotland? A confirmatory vote would have also enabled the electorate to match up the promise made by the Nationalists of minimal capital flight out of Scotland as a result of a Yes vote to the reality. The recent SNP Growth Commission has given us a glimpse as to what that reality would look like in the event of any future Yes vote. To their credit the Growth Commission stated that there would be a collapse of Scotland’s finance sector worth £15 billion to Scotland’s economy as its banking industry migrated lock, stock and barrel down south before independence day. A confirmatory vote would also have enabled the electorate to compare the claim made by Alex Salmond that Scotland would continue to use the pound to the actuality on the day of the vote, which would have had a major impact on pensions and mortgage payments. And a follow up vote on the deal would have allowed the electorate to pass judgement on the many questions that were not answered during the referendum campaign, such as how much of the UK’s £1.7 trillion debt Scotland would agree to accept, and how much interest a ‘new’ country without any credit history would be charged to service that debt. We would also have hopefully known who our lender of last resort would have been. 4. Should there be a recommendation made with regards to how often one can call a secession referendum on the same topic? The implementation of a confirmatory vote would make point 4 moot, as a successful confirmatory vote would in itself have legitimacy as the majority would have been seen to be in favour of the settlement. However, as things currently stand there are no guidelines as to how often you can go back to the same electorate with the same constitutional question. In the case of Scotland the case for Yes stated that the vote would be ”once in a generation”, but that did not stop an SNP-led Scottish Government passing legislation for a second referendum less than three years later. The lack of guidance on this point means that the losing side in any secession referendum can keep coming back in a ‘Neverendum’ until they get the result they want, which is an abuse both of the referendum construct and of the electorate. Select committees for constitutional affairs in the House of Commons and the House of Lords now need as a matter of urgency to conduct a joint inquiry into the lessons learned from the EU and Scottish referendums and make gold standard recommendations for future practice. The Brexit experience has changed public perception forever about how secession referendums should be structured in the future. The yawning chasm which exists between what Leave promised before the referendum compared to what is in the process of being delivered will be a game changer as to how referendums are constructed in the future. I would suggest that the people of Scotland would be in up uproar if there was any attempt at running a second independence referendum without, at the very least, a confirmatory vote being part of the referendum package. Those supporters of a second independence referendum who assume it would be an exact replica of the first have failed to understand the true impact of Brexit on all of our futures. This a non-sensicle article that argues against democracy itself. It seeks to enshrine the status quo in the statute books for eternity by putting impossible hurdles in the way of those who desire change. All the establishment has to do is frighten as little as 25% of the electorate (not difficult with a compliant MSM) with their stories of gloom, doom and disaster (see re-treads in above article) and the overwhelming majority has their wishes ignored! A more direct route to civil unrest is difficult to imagine. Unionists accuse Indies of using the UK’s incompetent attempt to withdraw from the EU to further the cause of Scottish independence. This article is the other side of the same coin. It is a unionist attempt to use the UK’s incompetent attempt to withdraw from the EU to further the cause of continued dependence. We were promised stability and prosperity if we voted to surrender our sovereignty once again to the UK govt in 2014. It was always a disingenuous proposition and has been proven false. Polls have consistently shown support for independence increasing to 50-60% recently as a direct result of the stunning incompetence of the UK govt dragging Scotland out of the EU against its will, while ignoring every attempt by Scottish politicians to mitigate the looming economic and social problems that will inevitably ensue. This article is a desperate attempt to thwart that drift towards independence, and taking control of our own destiny, by sabotaging democracy itself. The only good thing about it is it proves what many of us have thought for some time; that unionists are losing the arguments and are resorting to ever more desperate measures. Literally no opinion polls asking the direct question have shown support for independence above 50%, never mind approaching 60%. A couple of recent polls have asked hypotheticals based on possible Brexit outcomes; these should not be quoted as polls on support for independence. Hypotheticals are notoriously difficult to poll. Fair enough Mr Hothersall, but the UK leaving the EU is not “hypothetical”. It is going to happen no matter what Scotland wishes or needs. And they DO show support for independence if there is a “No Deal” or “May’s Deal” on Brexit, which are the only options available right now. Even asking the question with the “hypothetical” understanding Brexit has not happened gets a near 50% support for independence despite over 4 years of Tories campaigning incessantly for the Union and indies not formally campaigning at all. That is what is worrying Unionists more than anything else. Sorry. That is too wee for me to make out anything from it. My post stated “a NEAR 50% support for independence despite over 4 years of Tories campaigning incessantly for the Union and Indies not formally campaigning at all”. Your graphic shows this. Thanks. As you will see the overall picture is a gradual decline from 2014 to 2017 to an average of around 42% support for independence, a level which has broadly flatlined for the two years since. It seems to me there is no way that can be accurately described as “a near 50% support for independence”. It’s just not true. That’s not pedantry, it’s honesty. 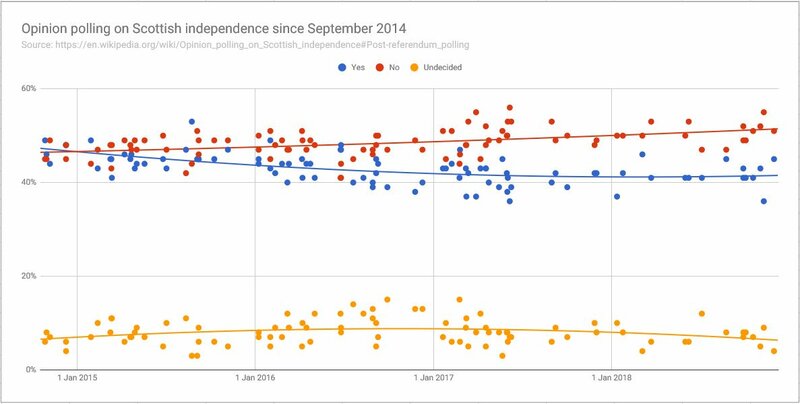 Excluding “Don’t Knows”, which is the standard way of interpreting these polls (in my opinion), support for independence has consistently been above the 45% achieved in the 2014 referendum. This, in my opinion, is NEAR 50% despite a continuous unionist campaign against it with no formal, organised indie response. If you are determined to look at a graph of all extant polling since the 2014 referendum which shows support for leaving the UK decreasing and support for remaining in the UK increasing and claim it shows pretty much the opposite, then there is little anyone can do to stop you. It is a staggeringly deluded thing to do though. I never made that claim though. The article makes a great deal of sense. What it doesn’t reflect on is the impact the second referendum would have on the way secessionists would campaign during the first one. I predict that the first referendum campaign would be a request for permission to negotiate the best deal possible; an easier ask than a clear vote for independence. The electorate, having been duly “softened up” would hear at least one of two messages; “Look at the great deal we’ve negotiated” or “Look at how the ***** English have tried to screw us”. The wording would be sweeter, but that would be the meaning! I don’t want part of anything that leaves a hard right Tory Government that could and would tare up employment laws without having to bother about Europe . The FM has kept saying wait until the Fog clears the time is nearly here to at least go for it ask if the PM says no then conduct your own advisory ref if its yes with a big turnout then go back to the PM and say Scottish people have voted . If no well we would be accepting a hard right Tory Government A hard right Tory Government would also take apart the Benefit system . I know one thing Westminster is not working for anyone . If yes they were told to take the body there and then they usually had to pay for help to get the body upstairs . Are you seriously arguing that a 36% vote against self governance should be allowed the will of 74% of the electorate? You must be truly desperate. The above is a non starter for the reason that if you look at turnout for local elections and national they are less than the lowest referendum turnout, then we look at voting totals for MSPs and MPs and they are very low so if you set thresholds for referendum then this would have to apply for all elections. The idea of setting thresholds in such a way is to frustrate and block the democratic right of the Scottish people’s to choose in a referendum a Yes or No to lndependence. Absolutely no reason I can see why thresholds for referendums should have to apply to all elections? Conversely, there is absolutely no reason I can see why thresholds should have to apply to referendums alone. If we accept Parties forming govt’s polling little more than 20% of the total electorate, making many social and economic decisions that fundamentally change the very nature and structure of society to a degree that single issue referendums pale beside, why should we demand the lesser democratic process have higher standards placed on it than the greater one? I agree with you again Bungo I will turn up my oxygen sort the problem out haha I think we badly need proportional representation at Westminster they wont do it .But it works in Scotland . If following a referendum there was to be a Yes vote then how can unionists frustrate and nobble the implementation and will of the Scottish people? answer easy we make up some gobbledygook Micky mouse confirmatory referendum. I think that the SNP should have a policy similar in name only to the Good Friday agreement that in an post lndependent Scotland that if the unionists ever wanted to rejoin the UK and the polling numbers suggested it then they could have what l would call an act of the Union poll in other words a referendum to rejoin the UK. Personally l envisage an lndependent Scotland to be successful and would be very happy to a member of an lndependent Scottish Labour Party in an Independent Scotland. I would say if we get an Indy ref then the Scottish Gov should say from the start no matter how we vote there will be no confirmatory vote . I would also say in the final say month before voting day no opinion polls should be published .Except exit polls . No polls for that last month in the press . Political parties can canvass and phone poll up to and including polling day but nothing in the press. We also need to look at name calling and online intimidation just look at whats happening with Brexit .threats MPS and MSPS receiving security advice Anna Soubry told stay in London last weekend as her partner was away . Annie Wells MSP abusive messages from some one who knew her movements . A man jailed for attacking Jeremy Corbyn and the paper said it was over Brexit . Also Jacob Rees Mogg and Boris according to ch4 news look as if they will back the PMS plan . In any Indy ref the Scottish Government should just play back some of the scenes we have seen from Westminster over Brexit and say do you think this lot can govern we can and will give you better than this . I thought at the pts of order debacle last night the Speaker had lost control although it was for me his own fault for going overboard with the put down . They are paid a lot of money I want and expect better from my political representatives . When I compare their behaviour to Holyrood Holyrood wins Westminster is not my parliament anymore Holyrood is no matter how Brexit goes . David l like your idea about not publishing opinion polls l think it would work. Watching the Brexit debate on the BBC News Hillary Benn just made the point the PM and others have all changed their minds at various points on Brexit so why cant we the people be asked if we have changed our minds as well. From a security point of view MPS and MSPS have been threatened online and Jeremy Corbyn attacked do we need tv news crews outside MPS homes .any nutjob with a grievance could identify where he or she lives . Why at the weekend at the Chequers summit could the heads of the devolved Governments not have been involved .Or at least The MPS from Scotland Wales NI .Boris and Rees Mogg are not Gov ministers and they were there I know this CH4 News filmed Boris driving with no seat belt . I watched a recording of the New Zealand Parliament debate on the New Zealand shootings it was on the BBC Parliament Channel . The PMS speech was simple compassionate moving a real leader trying to lead her country in troubled times when parliament applauded I joined in . I was of the opinion that even if there had been a Yes vote in 2014, unless it was a landslide in favour of independence, say 70%+ in favour, years of legal wrangling and negotiating would have followed. The MOD more or less said that there were few viable alternative sites for Trident in rUK during the 2014 debate but even if a solution could be found, it took 13 years to redevelop Coulport and Faslane from Polaris to Trident and 5 years to build the original sites for Polaris. So you’re looking at 10 years minimum to build replicate sites elsewhere. My guess is Scottish independence would be suitably delayed through the courts or the UK Parliament for at least that amount of time. Or the UK Parliament could fail to pass the subsequent legislation to enact Scottish independence at all. Realistically, after an initial outcry, for most ordinary people life would go on. The SNP would go apoplectic, absolutely tonto, but other than that, what could they practically do? The weekend papers were full of reports of a coup against the PM supposed to take place Monday what the papers say Sunday Times asked why is the PM still in place . Answer they cant make their minds up and 11 cabinet ministers lied to us . We were also told the PM is not taking her insulin we were also told she is but health not holding up and arrangements in hand to get the PM out of the chamber if PM collapses at the dispatch box . All of this courtesy of inside sources . Then after PM says she will go if deal passed we are told Mogg and Boris would not support but now they can if PM stands down .what rubbish . Brexit vote Friday Divorce bill EU Citizens rights and Irish back stop only .BBC calling it meaning full vote 2 and a half .All the Scottish Gov have to do in an Indy ref is keep showing scenes from parliament including last night with the Speaker trying to keep control CH4 news tonight a tory MP blamed everything on the speaker .And we are told Jeremy spent 20 mins on the phone to the PM . And why cant someone tell the DUP the people you represent voted remain. Well another Westminster vote lost .Huge crowds of demonstrators Brexit supporters this time out again .could have done without the orange bands or the SNP MPS being harassed and called traitors as they tried to go home. And Westminster staff being told need to leave via a side door . The whole atmosphere seems to have been different to last week .Riot Police deployed in Downing street someone tried to climb the gates 5 arrests overall . Scotland and Northern Ireland did not vote for Brexit someone should remind the DUP of that . I do accept the UK saw 17 million voted to leave and they feel they are being ignored a lot of them in Scotland we need to get round that . That’s why I cant see anything wrong with saying to the people look this has turned out to be a nightmare the consequencies might not be what you thought you were voting for so here is what we know this one time do you still want to vote for this . And if they do then that’s what needs to happen this whole disaster has shown us there is a total lack of political leadership at Westminster 1 Tory MP after another stood up yesterday and said something along the lines of for party and country I am now persuaded to vote for the deal . OH really whats the difference between that deal and the 2 previous deals voted down . Mogg I will vote for it if the DUP vote for it or abstain they did neither so he voted for the deal anyway . Boris persuaded himself he could vote for the deal he had also voted against twice . My party leader woeful absolutely woeful and I voted for Jeremy every time we should be way ahead in the polls we are not why not . The SNP I was surprized to learn abstained on 3 votes on Thursday or was it Wednesday there have been that many votes I cant remember . 2 of them abstained on the peoples vote see what happens when the petition which I signed gets voted on on Monday that for me was the SNPS first major mistake . Ch 4 news the Thames Flotilla during the EU ref and one of the organizers of yesterdays demonstration who said he represents fishermen for leave turns out to be a right wing blogger with ch4 news said links to Troon he went for a run when challenged at the demonstration on Friday . I voted remain I see nothing good in Brexit . I am afraid our MPS might be spooked because Peter Bone MP told the crowd yesterday contact your MP . I hope they don’t cave in I don’t want a no deal Brexit and I also realize there are a lot of Labour MPS in leave voting Constituencies and I also know all Scottish Tory MPS represent remain constituencies and their I will do nothing to break up the UK well vote this through and you might. There will probably be a Border Poll in N Ireland within a few years. Good luck to any person who suggests a majority for Irish unity would not be respected. Isnt it odd that Scotland ALWAYS appears to be singled out for special treatment by British nationalists (who pretend not to be nationalists)? Gavin don’t get the bit about Scotland always being singled out for special treatment . An Irish border poll don’t know if anyone wants to open that can of worms . But the Welsh Nationalists have a media savvy articulate leader who might put self rule on the map at the Cardiff assembly . “don’t get the bit……Scotland always singled out”. David, Scotland had a positive referendum vote in 1979—the same % outcome as Camerons EU referendum. We did not get a Scottish Assembly because Labour had inserted a 40% clause in the Bill. A clause which has never been used in the UK since. Now, Robert Hoskins is proposing the very same thing, along with other hurdles. I do not see that proposal for any other plebiscite within the UK. I suspect no one would dare include it in a Border Poll in Ireland (which may happen in a few years time)—-for obvious reasons. Thank you for your comment Gavin. Now you mention the 79 ref I get it .I was not in any political party at the time but I did vote yes Also from what I see today none of the political leaders of that era would have let the country anywhere near the mess we are in today .I would be interested to know what you think . At Westminster for me no political leaders in any party .Grandstanding on all sides MPS being threatened people jailed for it .Online threats I am remain but the people who voted leave I know are feeling let down by the system one man I used to work with told me that . The Brexit demonstrators were wound up by the speakers then MPS were harassed when leaving and staff told to leave via a side door . And a CH4 News crew attacked just for being from CH4 . On Scotland Tonight last night Joanna Cherry answering questions and clearly angry stated she thought the PM should resign and we form a temporary National Unity Government .. The PM now tells us I think she wants to talk to Jeremy to work with her possibly another EU extension .BBC Brian May just said this might mean she has abandoned her efforts of recent years and has no influence over her Cabinet or Party . After STV News there was an advert for a funeral company .Do they know something we don’t or maybe we do . Sunday paper Cabinet in revolt Chief whip has publically said Government should have said soft Brexit after the EU and Cabinet behaviour terrible Might be a general election PM kicked out and the queen in charge of us by Wednesday . Meanwhile back in the real world our world . I have been asking people in shops neighbours family what do you think .